I have a fantastic writing space tucked in the bay window area of our front room. It’s perfect for me. It has two storage cabinets on either side of my desk. It’s got everything I need…and I never use it. I haven’t sat at my desk in MONTHS. 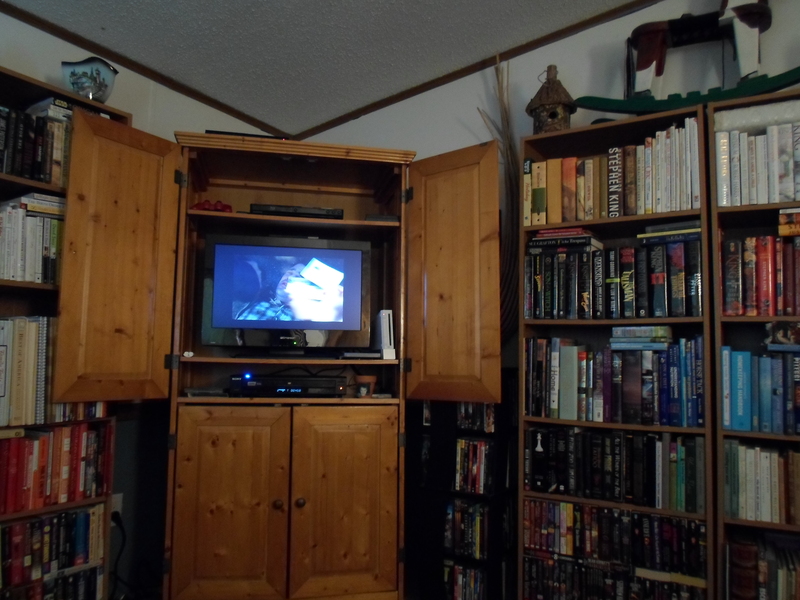 I also have a bedroom we converted into a library. I hide my storyboard in there. It’s a great writing area. But most of the time, I don’t write in here. It’s been several weeks since I’ve written anything in here. 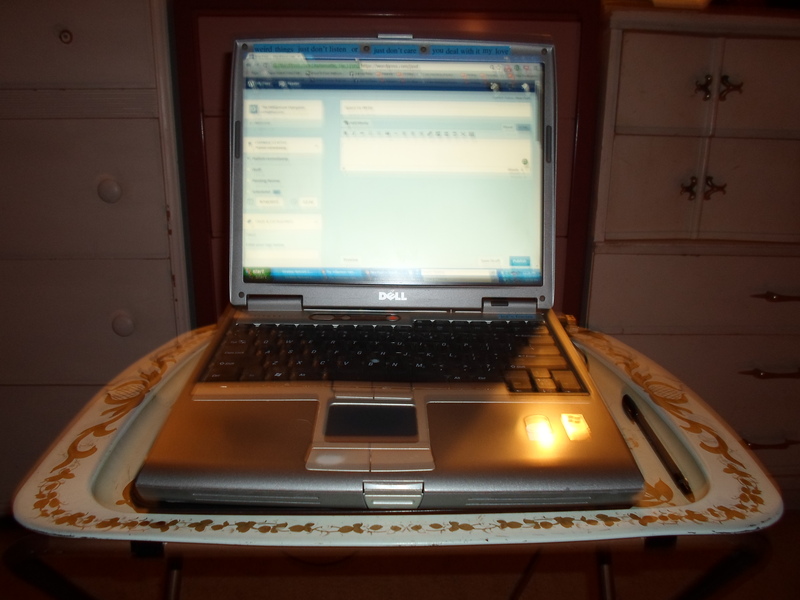 I sit in front of my laptop and use an old TV tray table. My writing space is wherever I am. 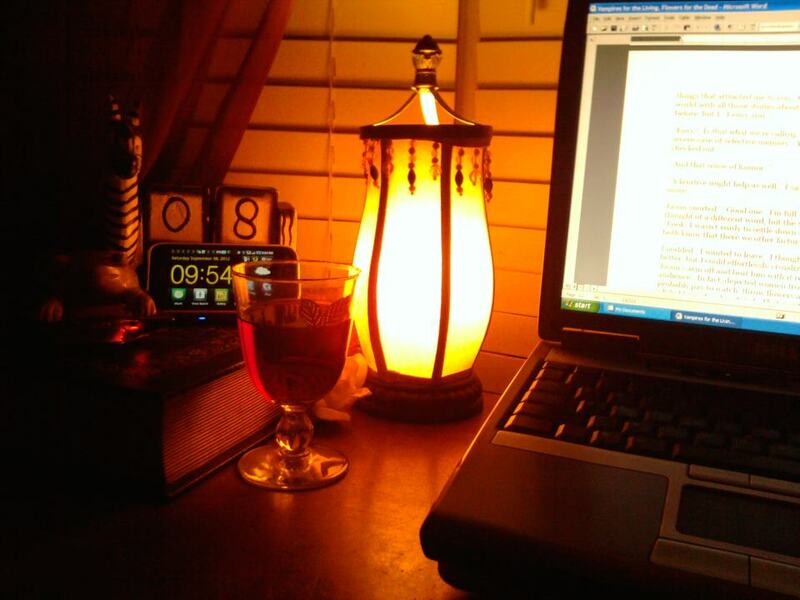 I finally figured out there isn’t a “Perfect Writing Space.” It’s an illusion, an excuse for not wrinting. I always thought, “If I had my own space to write, I’d write more.” For me, this was not true. This was perfectionism talking. If you’re searching for the perfect space, the perfect time, the planets to be alligned in the perfect order, you’ll never have time to write. Life isn’t perfect. Squeeze in your sentences whenever and wherever you can. As for the rest? Forget about it! Next postI’m NOT An Aspiring Writer. Good advice – write wherever and whenever the inspiration strikes. Sometimes, I need the quiet. Most of the time, I write more with a little life noise going on in the background, either from my hubby, the kiddo, the pets… I suppose that’s why some people write better inside a coffee shop. Perfectionism gives me tons of excuses for NOT writing. I used to tell myself, “If I had more time, I’d write.” Then I lost my job. I had all the time I could ever want before I got another job. But I wrote less when I was home full-time than when I was squeezing in sentences where I could. It threw that theory out the window! Same thing with the “perfect writing space” or the “perfect writing time.” I make excuses for myself. Sometimes, I think there’s a part of me that doesn’t WANT to be happy, and that scares the begeezes out of me! I think it may be a part that doesn’t want to fail. If we fail because we didn’t get it done then it’s not really US who failed, it was time constraints, yadda, yadda, but if we write it, put it out there, and no one likes it, then it’s our writing that failed – it’s US that failed. Wow! That’s the truth!!! Big F on the forehead kind of failure.